The steamer Little Missouri arrived last night from the Missouri. An express had arrived at Fort Leavenworth, bringing the gratifying news of the entrance of General Kearney into Santa Fe, without the firing of a gun, or any opposition from the Mexicans whatever. It appears from our correspondent’s letter, that after leaving Fort Bent, most of the ammunition wagons of the artillery were forced to put in oxen instead of the other animals; that the oxen had also given out, and it was with great difficulty the oxen proceeded onward. Several hundred horses and mules were left behind the army, unable to follow. THURSDAY, August 13 — Started at 12, M., Col. Doniphan’s regiment in sight as we left the camp. We soon met the spy company, (Capt. Bent,) with. with his small party, had captured four Mexicans, well mounted and armed. They summoned him and his party to surrender, but the Captain told them that he thought their safest plan was to surrender to him. They prudently consented to do so. They acknowledged themselves sent to ascertain who we were. They were made prisoners. One of the Mexicans who was taken day before yesterday, was disarmed and sent forward to his village, distant 24 miles, with letters and proclamations. He promised to meet us to-morrow. At 8 miles we came to the establishment of a Mr. Wells, an American. He had an abundance of horses, mules and cattle. With him was another American, who had been sent from Santa Fe, by an american merchant of that place, to inform Gen. K. that the Mexicans were 10,000 strong, and had determined to meet us 15 miles this side of Santa Fe, at a deep ravine which they were fortifying. He stated, as his opinion, that not more than 2,000 would be well armed; and also, that they had four pieces of cannon. The Americans of Santa Fe and other towns, are very much alarmed for their safety. The Mexicans tell them that if defeated, they will return to the towns and villages and take full vengeance on them. As this news is communicated to us in a heavy rain, and we are encamping in the midst of it No little excitement prevails in camp. To retreat nine hundred miles is idle; (no one thinks of it,) and if they do meet us, as they have promised, we shall vindicate the character of the Saxon blood in death or victory. Mark that! — Gen. Kearney is as cool as if walking to his office on a May morning to attend to his accustomed garrison duties, and all look to him as to a man who is to shed glory on the American name. It is said here that Gov. Armijo is opposed to daylight, but is urged on by the rich men of the country; yet the latest accounts are that the rich are backward in lending their money. But if ten thousand men are assembled, they must have furnished the means. There is a Mr. Bondy living near this place. He visited us and gave us a fat steer. This is the first settlement we have met. The place is called the ‘Moro”– Two beautiful mountain streams meet here, each of sufficient size for milling purposes. The artillery came up at sundown. At this place the road by the Simerone comes in. FRIDAY, August 14. — Started at 7 o’clock; at four miles met four Mexicans sent by Gov. Armijo to Gen. K. with a letter. They were dragoons, dressed in a roundabout and pants of light blue cloth similar to our own dragoons with a red stripe down the outer seam of the pants. They all wore large Mexican hats; there was a Lieutenant, sergeant and two privates. They made a very respectable appearance, but such soldiers cannot fight U. S. dragoons. Their heavy horses and superior equipment will conquer them. The four dragoons above spoken of, and those taken a day or two since, were set at large to-day. The Colonel told them that he had come with a sufficient force to extend our laws over them.– That he came as their friend. That he came to give protection alike to the poor man and the rich. That, although he had the power to do as he pleased, still his orders were to treat all who remained at home in the peaceful pursuit of their business, as friends. But that if found in arms against him, the vengeance of his government and army would be poured out upon them. He told them that, not “an onion or a pepper would be taken from them without a full equivalent in cash; “that their persons, property and religion, would be respected. That he would soon be in Santa Fe and that he hoped to meet Gov. Armijo and shake hands with him as a friend; but if that were denied him, he had a force sufficient to put down all opposition, and that he would certainly do it. We are encamped at the Passes; at this place runs a small mountain stream, and near it a village containing, probably, 100 mud built houses. There were three hundred mounted men here yesterday. They have all gone to Santa Fe, no doubt to join the main army, which is said to be 12,000 strong-2,000 well armed, four pieces of artillery (one six pounder taken from the Santa Fe prisoners). The other 10,000 are said to be armed with bows and arrows, slings and other weapons–the Mexican, dragoons report that Capt. Cook left Santa Fe with them, but as they got a change of horses, they outrode him. (The Captain had been sent from Bent’s Fort by Gen. Kearney with letters to Gov. Armijo) He will be with us to-morrow. From white man who reside here, we learn, that the Governor exercises the most despotic way over the common people, aided by the priests. They say to such men as we have met, “go on such a road, ascertain where Cook and his men are, and return to me at such a time.” They furnish no means for the performance of the duty, and give no compensation. Yet no Mexican dare refuse, or fail to perform the duty. What a change will be effected among these people when they are emancipated! If General Kearney succeeds in this expedition without inflicting any pain he will be the greatest man that has ever been in New Mexico. There are extensive fields of corn near us cultivated by irrigation. After spring sets in there is no rain here till August, when they have refreshing showers, and the grass begins to grow again. The rain of this season commenced about ten days since and grass is more abundant. But for this, it would be impossible to take our animals to Santa Fe, probably not beyond this place. Gen. Kearney’s “good luck” still attends him. We have passed within the last two days, cattle and sheep enough to subsist the army all winter, and we have no fear of starving. SATURDAY, Aug. 15.–Started at 7 A. M., and passed through the village. The Col. was overtaken at this place my Major Swords from Fort Leavenworth, who brought him a commission as Brigadier General. He continued the Alcalde in his office, and told him to be governed by the laws of Mexico, for the present. He stated to them that he had been well informed “that some of the priests had endeavored to make them believe that he was coming to destroy their religion and to inflict grievous wrongs upon them.” This, he said, was false. He told them that their persons, property and religion would not be interfered with. Now, said he, under these circumstances, are you, “Mr. Alcalde, and you, two Captains of militia, willing to take the oath of allegiance to the United States.” Two of them readily consented, but one of the Captains evaded the question. The General demanded a categorical answer. The Captain said, “yes,” but it was evident it was with a bad grace. They then raised their hands and made the sigh of the cross with the thumb and finger, all present uncovering their heads, and the General in a solemn manner administered the following oath: “You do swear to hold faithful allegiance to the United States, and to defend its government and laws against all its enemies, in the name of the Father, Son and Holy Ghost,” or words to the effect. The General then said–“I will shake hands with them as good friends.” When he came to the Captain, who did not seem to enter fully into the matter, he took him by the hand, and told the interpreter, “tell the man to look me in the eye.” The General gave him one of his significant smiles, and with his keen eyes fixed firmly on him, seemed to say, “I know you are a rascal,”–(such, he no doubt was,)–but the others, I think, were honest. He then told the people, (about two hundred,) I shake hands with our all, through your Alcalde, and hail you as good citizens of the United States; upon which they raised a general shout. At this town are extensive fields of wheat and corn, cultivated by irrigation, from a beautiful creek. the water is taken out on each side in canals, and spread over their fields. It was a beautiful sight to see the clear mountain water rushing through these canals, and producing luxuriant field of corn and wheat, where rain so seldom falls. Our camp was near these fields, and although sentinels were placed very near together, with strict orders to keep every animal out of them, yet some did get in, and some damage was done. 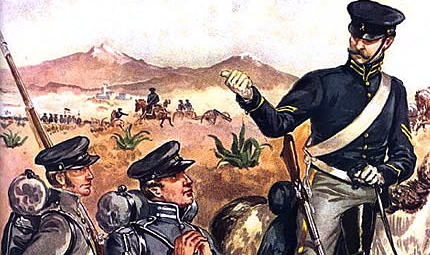 The General told the Alcalde that he had used every precaution to prevent “any interference with their crops,” yet “they had sustained some loss.”– He told him to examine the fields and ascertain what the damage was to each man, to send him a statement of it to Santa Fe, and that full compensation should be paid them. they seemed delighted with this exemplification of equal justice–a thing not dreamed of in New Mexico, under the rule of Armijo. News reached the General late last night, that we would have a fight to-day in one of the mountain gorges, and our movement has been in a strict military manner. When passing through these narrow defiles, (where an enemy would be most formidable,) the word, “draw sabre,” was given, and we passed through at a fast trot. But no enemy has been seen. The infantry passed over the mountain to take them in rear. We passed through several other villages, where the General assembled the inhabitants, and proceeded as with the first. The two last appeared happy to be recognized as citizens of the United States, and were seen to embrace each other in token of their joy at the change of government. At the last one, they brought forward their wives to receive the congratulations of the General. (whose manner on such occasions is most happy,) and it was evident that his words had gladdened their hearts, for they smiled upon him in a manner which woman alone knows how to do. We encamped at 4, P. M., in poor grass, having marched 17 miles. Captain Cook met us to-day, from Santa Fe, and says Governor Armijo will meet us with an army. He had been kindly treated while in Santa Fe, and smoked many a “segarrito” from the fair lips of the ladies. The villages we have passed to-day are built of sun-burnt bricks. The houses have flat roofs, covered with earth, and are dry and comfortable, from the absence of rain or moisture. Each one has a church, and a grave yard, with high walls of sun-burnt brick. There is more intelligence among them than I expected to find, and with a good government and protection from the Indians, they will become a happy people. The Eutaws have recently stolen their stock and carried off several children. Well may they hail this revolution as a blessing. One of the Alcaldes to-day said, that God ruled the destinies of men, and that as we had come with a strong army among them to change their form of government, it must be right and he submitted cheerfully. Major Swords and Lieutenant Gilman brought us the mail to the 19th July, and many a heart was made glad by tidings from wives, mothers, children, and dearly beloved ones. There are plenty of cattle, sheep, and goats, in the country, and we shall fare well enough. The General then said, “I continue you as the Alcalde of this village; and require you , the inhabitants of this village, to obey him as such. Your laws will be continued for the present, but as soon as I have time to examine them, if any change can be made that will be for your benefit, it shall be done.” After shaking hands with them he left. The Padre then invited him to his house, and gave him and his staff refreshments; and after sundry hugs, jokes, and professions of friendship, with an expression from the General, that “the better they became acquainted, the better friends they would be,” and an invitation to the Padre to visit him at Santa Fe, (which he promised) we left the village. The Padre was evidently the ruling spirit of the village, and the Alcalde was under great restraint by his presence. The visit to the priest, and the frank and friendly manner of the General, had the desired effect, and I believe they parted the best of friends, and have no doubt that the inhabitants of St. Miguel will soon be as good democrats as can be found in Missouri. The Alcalde informed the General that 400 men left the village to join the Mexican army, but that 200 had returned home. Soon after leaving this village, an express arrived from Santa Fe, informing the General that a large force would oppose his march 15 miles from the place, in a deep ravine. It was headed by an individual known as Salazar; that Gen. Armijo refused to command them, and said he would defend the town. The same information was soon after brought by Puebla Indians, who said there was a large force of their people among the Mexicans, armed with bows and arrows; that their people had been forced into the service, and that their chiefs would not permit them to take their guns. As it is not more than two days march to Santa Fe, if we have a fight it will probably be to-morrow. Marched 17 miles. MONDAY, Aug. 17.– Started at the usual time. Our picket guard took a prisoner, the son of the noted Salazar, well remembered by the Texan prisoners for his cruelties to them. He stated that the Mexican army had left the cannon and gone home. The General told him he would keep him a prisoner, and if he found that he had told him falsely he would hang him. We soon met others from Santa Fe, who congratulated the General on his arrival in the country, and their deliverance from the tyrannical rule of Armijo. They further said, that Armijo had taken one hundred dragoons and his cannon, and gone this morning towards Chihuahua. We passed to day the ruins of the ancient town of Pecos. I visited it with some Mexicans and an interpreter, who gave me a full account of it. It was said to have been built long before the conquest.– It stands on an eminence. The dwellings were built of small stones and mud; some of the buildings are still so far perfect as to show three full stories. There were four rooms under ground, fifteen feet deep, and twenty-five feet across in a circular form. In one of these rooms burned the “holy fire” which was kindled many centuries before the conquest; and when the Pecos Indians were converted to the Catholic faith, they still continued their own religious rites, and among them the “sacred fire,” which never ceased to burn till seven years since, when the village was broken up. The population is probably one thousand. the church is large, and although in ruins, was evidently a fine building. It was built after the conquest. The eastern roof of the main building is still good — it is filled with birds. As we came in front of it the Mexicans took off their hats, and on entering the building did the dame. The General learned to-day that Salazar had been in command at the cannon, and that he had passed around us and gone to St. Miguel, the town we passed yesterday. the General sent him word that he had his son a prisoner, and would treat him well, if the father remained peaceable, but if he took up arms, or excited the people to resistance, he would hang him. We encamped at 3 P.M. on the Pecos Creek, in excellent grass, where was a beautiful farm, well watered–distance to-day fifteen and three quarter miles. An abundance of vegetables have been brought into camp this evening, and we have not fared better since we left Missouri. Bread, coffee, and bacon are excellent articles of food, when accompanied with other little “fixings,” which ladies only can provide us with, but of themselves, after a few weeks, campaigners become a little tired. An American gentleman has just arrived in camp from Santa Fe; he left at 12 M. to-day, and says that after the Governor’s abdication, the Alcaldes held a meeting and gravely discussed the propriety of tearing down the churches, to prevent their being converted into barracks, and that the American citizens interfered and assured them that they had nothing to fear on that subject, and thereby saved the churches. A lady also sent for him this morning, and asked him if he did not think it advisable for her to leave the town, with her daughters, to save them from dishonor. He advised her by all means to remain at home, and assured her that she and her daughters were in no danger from the approach of the army. Most of the respectable people of the town have left, and many country people are going to town for protection. TUESDAY, August 18th.–Started as usual, and at six miles came to the cannon, where the Mexican army had been assembled. There had been 3,000 troops there, but it seems that the nearer we approached that the fewer they became, and when we passed through they had all gone. The position they chose was near the lower end, and it was one of great strength. the passage was not more than forty feet wide — in front, they had made an obstruction with timber, and beyond this at 300 yards distance, was an eminence in the road, on which their cannon had been placed; and it was thought by us, that their position was equal to 5,000 men. We reached the hill which overlooks Santa Fe, at 5 P. M. Major Clark’s artillery was put into line, and the mounted troops and infantry were marched through the town to the Palace, (as it is called,) on the public square, where the General and his staff dismounted, and were received by the acting Governor and other dignitaries, and conducted into a large room. The General stated, in a few words, the object of his visit, and gave assurances of safety and protection to all unoffending citizens. while this transpired, the stars and stripes were hoisted on the staff which is attached to the Palace, by Major Swords; and as soon as it was seen to wave above the buildings, it was hailed by a national salute from the batteries of Captains Fischer and Weightman, under the command of Major Clark. While the Genral was proclaiming the conquest of New Mexico, as a part of the United States, the first gun was heard: “There,” said he, “my guns proclaim that the flag of the U. S. floats over this capital.” The people appeared satisfied. The General slept in the palace, (we democrats must call it the Governor’s house). 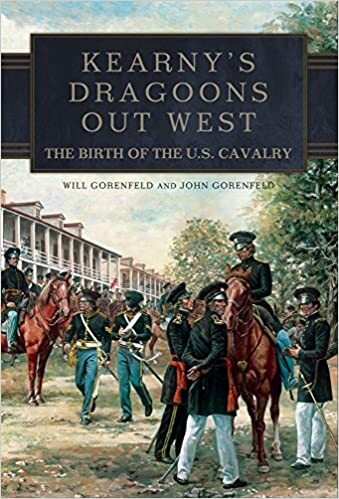 One company of dragoons was kept in the city as a guard, and the business of the day was ended. Thus, in the short space of fifty days, has an army been marched nearly 900 miles, over a desert country, and conquered a province of 80,000 souls, without firing a gun–a success which may be attributed mainly to the skill and ability with which Gen. Kearney has managed this arduous and delicate business. In explaining his object in coming into the country, and the kindness he felt for the inhabitants, he was mild and courteous; but then, (would add,) I claim the whole of New Mexico for the United States. I put my hand on it from this moment, (bringing his hand firmly down on his thigh,) and demand obedience to its laws. WEDNESDAY, August 19.–The general addressed the whole people to day more at length than he had on other occasions, and took particular care to give them the most positive assurances of protection in their person, property, and religion. Many families had fled on his approach, and he told their friends to bring them back, and to day to them that they would be more safe under his administration than they had ever been. He stated, that in taking possession of New Mexico, he claimed the whole of it for the United States, without reference to the Rio Grande. He absolved them from their allegiance to Mexico and Gov. Armijo, and proclaimed himself governor of New Mexico, and claimed them as citizens of the United States. “John Baptist, Vigil and Alcalde, political and military Governor pro tem, of the department of New Mexico, to the inhabitants of Santa Fe, the capital thereof, greeting: It having been out of my power, by all the exertions that I could put in practice, to calm the fears impressed on the inhabitants by the desertion of Gen Don Manuel Armijo and his soldiers, and what was most frightful, he having made them conceive, on the approach of the military forces of the government of the United States of North America to the capital, that said forces were composed of cruel and sanguinary savages, and for which many families have left their homes, to hide themselves in the desert–believing that no security, no protection of their lives or property was to be expected from the commander of said forces; and in order to appease these fears I thought it convenient and necessary to order ot be set up in the most public places, the proclamation of the chief of said forces, of which the following is its tenor.” He then read the proclamation which Gen. K. had sent among the Mexicans in advance. THURSDAY, Aug. 20, and FRIDAY, 21st.–The General sits in his room, and is constantly receiving visits from the officers of ex-Governor Armijo and others, who fled on his approach. To all who remain quiet and peaceable he promises protection. Many of then come into his presence very much disquieted, but he has the happy faculty of calming all their fears, and he is winning laurels among them daily. Ex-Gov.Armijo has certainly fled. The cannon he took from the place have been re-taken by Capt. Fischer, and will be here soon. The gun taken from the Texan prisoners was left in a mountain, carriage destroyed; the gun, a brass six pounder, has been recovered. SATURDAY, Aug. 22.–The General is still receiving visits and attending to matters and things which are referred to him. Capt. Waldo, of the volunteers, is translating the few written laws which can be found. SUNDAY, August 23.–The General and his staff, and some other officers, went to church to-day. There are no seats in the church, except one for the governor, and a bench on which his subs sit. Gen. K. occupied the former, and we the latter. The rich and the ragged kneel, or sit on the floor, as best they can. When the Priests were ready, the service commenced with a piece of music not unlike what I have heard at the theatre, and pretty well played. This continued with different pieces of music till the ceremony was over. After which, they escorted the General to his quarters with music. “On to-morrow a body of troops will march towards Albuquerke, to take possession of that district. It is supposed that a detachment of the army will also soon be sent to California. The artillery, under Major Clark, is erecting fortifications in front of the town. The two companies under his command, commanded by Captains Fischer and Weightman, it is generally supposed, will be stationed here, supported by some other forces; Major Clark commanding the garrison. These are the current reports, generally credited, although Gen. Kearney can hardly know for certain how the appearances of things may change, and what steps may become necessary to ensure a permanent tranquility in the province. We published yesterday, exclusively, a very minute account of General Kearney’s march to Santa Fe, of his entrance into that capital of New Mexico, and of his taking possession, on behalf of the United States, of the entire department. It would seem that General Armijo had actually 4,000 men at his command, but very badly armed; and that on the 16th they left for the place appointed as the battle ground. When he got there, however, a council of his officers was called, and, “much to his satisfaction,” they refused to fight. His second in Command, Colonel Archuletti, was exceeding valorous up to a late date, but very suddenly changed his entire views of the necessity of the quarrel. Very soon after this determination, Gov Armijo turned his head towards Chihuahua, followed by a few dragoons. It was supposed that General Kearney would nominate a Mexican for the office of Governor of the department, and appoint an American as Secretary. All those in office, who were thought to be trustworthy, would, in all probability, be continued in their places. Gen. Kearney, it was supposed, would leave a force of 2,000 men in Santa Fe, and march, in a short time, to California with a like number. The traders who were overtaken by Gen. Kearney’s force, were close at hand, but it was believed that they would not be able to make sales of their goods in Mexico. They would be compelled to make their way slowly down the Del Norte, awaiting the result of Gen. Wool’s movement against Chihuahua. Lieut. C. Kribben, of the Artillery, had been appointed Judge Advocate, and was acting in that capacity in a Court Martial which had been some days in session.